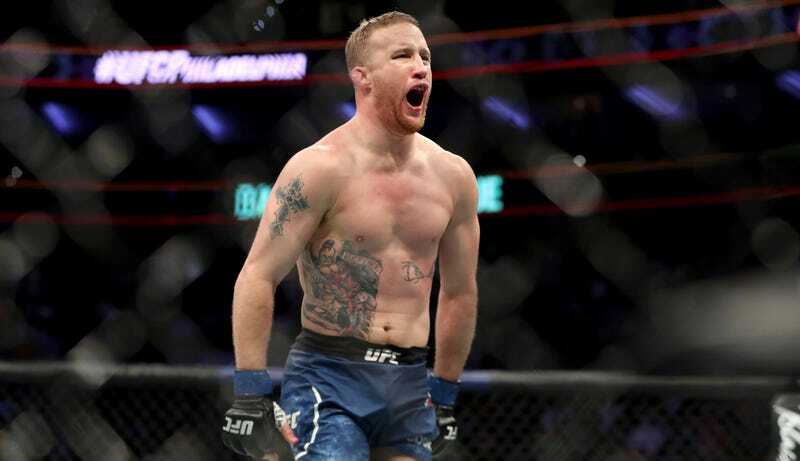 After throwing his fist through the face of Brazilian kicking master Edson Barboza in a bout last weekend, Justin Gaethje concluded his fifth fight under the UFC banner in brief, brutal fashion. In that span, he’s scooped up six post-fight bonus awards, which somehow seems insufficient for someone as reliably violent as Gaethje. He earned his fight of the night bonus in style last weekend, ending Barboza with a single big right hand that caught the Brazilian cleanly as he tried to circle away from Gaethje’s infliction. Gaethje spent the first minute of the fight trading leg kicks with Barboza. This strategy would have been suicidal for most anyone else. Gaethje, though, is one of the most punishing leg kickers in the sport (he has three TKOs via leg kick), which allowed him to win that phase of the fight. Once Barboza could no longer rely on his lead leg to the usual extent, he was more or less cooked. Barboza is wont to destroy anyone who stands at range and lets him throw huge kicks, but Gaethje is a pressure fighter who doesn’t mind getting touched up. He closed the distance, and Barboza didn’t stand a chance. His coach was unsurprised, even in the face of Gaethje’s tremendous knockout shot. Gaethje has only ever let the judges decide two of his 22 professional fights. That probably won’t stop anytime soon, no matter who the UFC matches him up against. His only two losses have been all-out brawls against two of the best fighters in the division. Now that he’s racked up two straight first-round knockouts, he deserves another crack at the cream of the lightweight crop. There isn’t any 155-pound fighter alive that wouldn’t at least take some serious punishment against Gaethje, and there are very few that would be favored to beat him. The tragedy of all this is that Gaethje is still too hittable to do this forever, and he knows it. No fighter more gleefully absorbs punishment and continues to walk forward. His losses to Dustin Poirier and Eddie Alvarez were his most thrilling fights, simply because his superhuman endurance pushed his elite opponents to the absolute brink and forced them to dig deep. I hope Gaethje knows when it’s time to hang his gloves up, since he only fights at one pace.